The GO-M3 Manual Gate Opener generates an operator paced power output of 3,200 ft-lbs with only 173 ft-lbs of input power. The WORKMASTER® GO-M3 Gate Opener is a manual-powered, hand portable, compact Hopper Car Gate Opener that rests on the ground while engaged in a railcar capstan. The GO-M3 Hopper Car Gate Opener, a heavy-duty torque multiplier, uses planetary gear action to enable an operator to simply turn a ratchet wrench to open gates. Allows the GO-M3 to accept either a manual ratchet wrench drive input tool or an air-powered ratchet wrench drive input tool. Protects against overloading the GO-M3 power train by shearing at 3-10% over the 3,200 ft-lbs rated capacity. Enables one worker to safely and easily generate the job-required torque with the GO-M3 kit’s 1/2″ drive ratchet wrench. Precision machined, 4140 tool steel, 1-piece construction with 1″ sq socket using 1-piece Ret-Ring Retainer opens hundreds of gates. 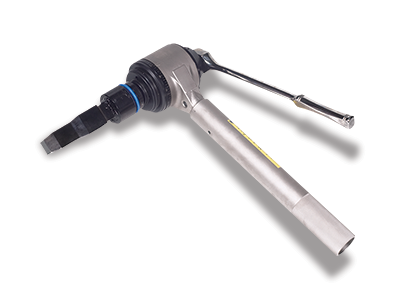 Enables the GO-M3 to maintain input torque when using a manual crank handle or air-powered ratchet wrench drive tool.